The Saint John Hotel Association is a member-driven association, representing 11 members and 1156 guest rooms in the Saint John area. The Association was established in 2007 to implement the voluntary legislation to collect a 3% Destination Marketing Fee (DMF) and be a catalyst in the formation of the public-private Destination Marketing Organization (DMO). The Association is a recognized leader in Saint John’s $250-million tourism industry. The Saint John Hotel Association is the voice for the hotel, motel and bed & breakfast industry in Saint John. We believe tourism is critical to the success of our community and that a healthy tourism sector results in a proud, vibrant community for everyone. Our mandate is to grow tourism revenue for Saint John and the province as a whole. Contributing to the growth of the tourism sector, as part of the True Growth 2.0 economic development planning process. 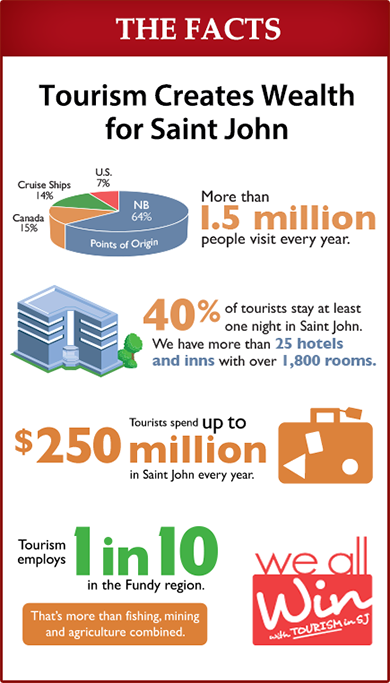 Growing tourism revenue in Saint John and the province overall. We are guided by our members, values and priorities. Read more about member information and the structure of the association here. Considering a visit to Saint john? From whale-watching on the Bay of Fundy, to fine dining and shopping, check out Discover Saint John’s website for all the information you need to plan your trip. Saint John is no longer becoming. Saint John has arrived. We’re working to introduce the world to our city. We’re proud of what’s happening here. We’re helping to build and grow our city. This is your Saint John. Discover the Wins.